The snow has finally left us alone (for now) although there was a bitterly cold wind blowing today, but that never stopped us taking a donder over to Stanley to the site of the old mill. 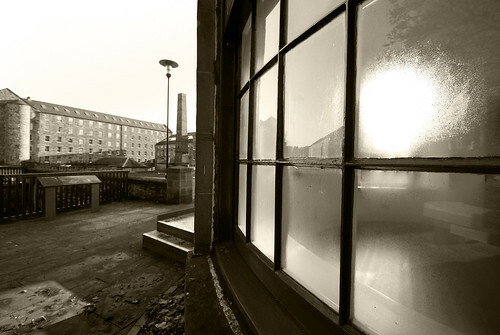 Now a museum and apartments, Stanley Mills was the provider of textiles for over 200 years. Stanley itself was originally built to house the mill workers. The buildings are beautiful and if you are in the area it is well worth a look-see. There is a walk down by the river if you head away from the Mills and towards a very large private house, which you avoid by following the signs to the right. Following the water upstream leads to several paths that all end up in the same place and are mainly areas for the fishermen. Taking the steeper option takes you to an old tower-esque building and well which is very cool, if a bit ruined. 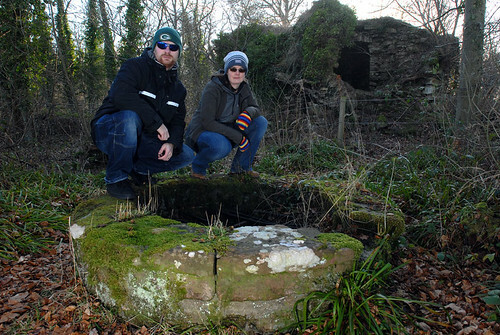 The cold wind was just about bearable so we managed to get a couple of decent shots, including the one above of us standing on the edge of the old well. I resisted the temptation to shove Sarah in, but only because it was covered over with iron bars. so at last we got out and about again. Bout time too! I had the car for a change so didn’t have to wait on the very old bus to get out to Luncarty, which put me in a very good mood. So after hunting for a power cable I had already found, printing out yet more baby photos for father and getting lunch for me and Ian (dam people were expecting a lot from me!) I headed out to the wilds of Luncarty. After dropping the wee one at Nursery we headed to Stanley which is just down the road. 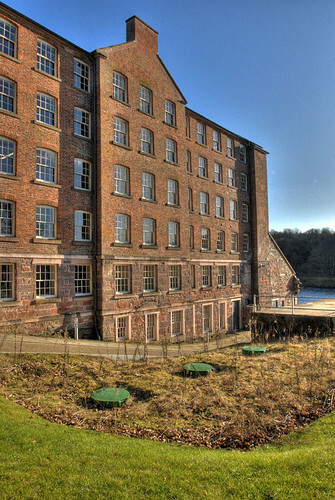 I lived there for a couple of years when I was young and remember visiting the mill on a school trip. It was in full working order then, though large areas were no longer used. I vividly remember working around with the machines going and the cotton heavy in the air. Health and safety would have a heart attack these days if you took a primary school class to such a place, but back then they just didn’t care about filling our lungs full of cotton particles or losing limbs in machines! Now though it is a museum and some very expensive apartments. But very well done and is still a beautiful and imposing range of buildings. Of course I felt really old as the signs make out it was only open hundreds of years ago, not also in the 80s. After having a good nosey around the main mill we headed down the river, which used to have old ruins of cottages with free range chickens in them and fields with horses and the remains of the old owners house. Used to love playing down there as a kid. Now however there is a couple of very large private houses and a whole load of signs telling you can’t go anywhere. There is however a right of way along the riverside which leads you up the hill to the old smoke house, which is hard to find as is covered in ivy and such like. So had a wee wonder round up there in the freezing cold wind and Ian had me stand on a well for too long to take some photos of how stupid we are to go out in such cold. I know he was hoping i would fall in but my impeccable sense of balance made sure I was safe and sound, well that and the metal grill covering it! I remember this smoke house having demon worship kinda stuff around it like straw dolls and things written in stone. It was all quite scary as a child, but now is a nice little adventure! Anyway after not falling into wells or being blown off into the river which meanders around two sides of the site, we headed back to the car and warmth! Can’t wait till spring when I can venture out with less than 4 layers on and only 1 pair of socks!